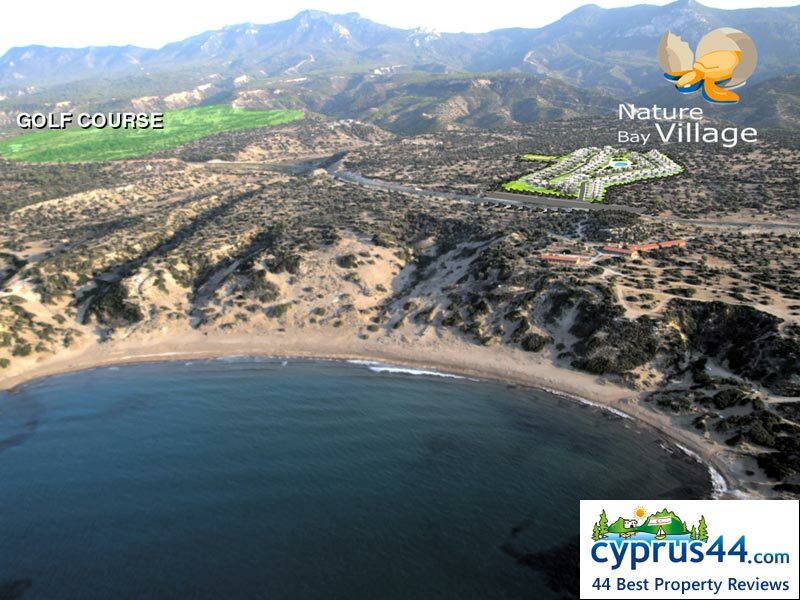 Nature Bay Village is one of the best properties listed in Cyprus44 property reviews. Nature Bay Developers have stuck to a simple formula that has brought them great success. The build a range of affordable homes and apartments on the cheaper land sites east of Kyrenia, yet which are close to new amenities and are accessible via the new coastal road. Their developments include the Nature Bay Village villas and bungalows, the upmarket Nature Bay Beach Villas, plus the Sea Vista and Sea Point apartments. The company has experience developing properties in the UK, Europe and the Middle East. Nature Bay Village enjoys a prime location overlooking one of the best beaches in the whole of North Cyprus - Alagadi or Turtle Beach, and enjoys splendid views of the Kyrenia Mountains behind. The beach itself is just a 300 metre walk away, where young and old will be fascinated by the rare sea turtles which nest here, and enjoy special protection too. In addition, the new Korineum Golf Club is just 800 metres away from the Nature Bay Village villas, and the new yacht marine will be just a five minute drive away. There are three types of villa style on sale at Nature Bay Village; one duplex villa design and two bungalow designs. The design ‘A’ duplex villas enjoy a traditional white-washed design combined with a clever internal layout that cleverly blends inside and outside space together. Upstairs, the master bedroom patio doors open onto a roof terrace for great views out over the Mediterranean Sea. The bungalows share the same clean, white design, and their one storey construction means there is plenty of roof terrace space to enjoy! The Nature Bay Village site includes a communal swimming pool so you can get to know your neighbours, or there is an optional private swimming pool option available. There is an outside barbeque area for each villa plus a fireplace for chilly winter nights. 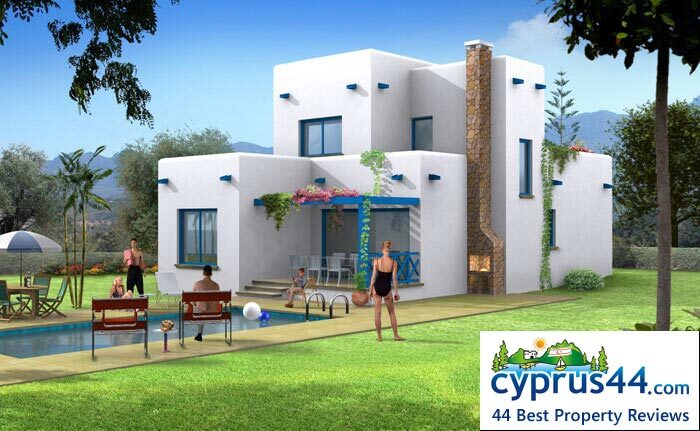 Nature Bay properties also offer property investors the opportunity to upgrade their North Cyprus villa or duplex for year-round occupancy, by adding gas radiator central heating if required. Unlike many developments, air conditioning is fitted in the master bedroom and living room, with the pipework laid in the other areas ready for connection if you wish. There are some extra touches that separate out Nature Bay Village villas from other developments, such as the pergola carport, so your car does not fry all day in the North Cyprus sunshine! At time of writing, just under 50% of the development has been sold or reserved, so there are still plenty to choose from. The Nature Bay Village development duplex villas certainly offer a different design and use of space to many other developments, and certainly they are what most UK buyers imagine a Mediterranean home should look like! 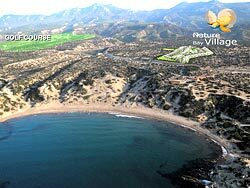 The advantage of being so close to the new facilities and the extra bonus of being opposite one of the best beaches in North Cyprus probably puts Nature Bay Village high on the list for anyone looking for a quality North Cyprus villa in a great location. Furthermore, the TRNC government is keen to preserve this coastline to protect the turtle population, so developments this close to the beach may not be available in the future. The Nature Bay Village is well worth investigating, and Nature Bay Developers offer an inspection trip from the UK for just £195 per person including two night's accommodation. This web page is served on 19 April 2019 at 23:44:33.